I came across a pretty cool hunting accessory called The Game Hauler. The name says it all. It was designed with hauling big game in mind but the design makes it so much more versatile. Basically you can use it to haul anything that you can strap it to. I decided to order a few since I knew a few people who could take advantage of such a handy tool. 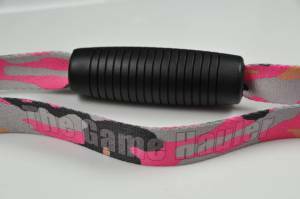 This accessory comes in different camouflage options as well as blaze orange. This product is great for everyone but let’s face it I think it will particularly benefit women. With less upper body strength than most men The Game Hauler is leveraged to give you a hand. For women who hunt on their own this is the product for you. I know there has been a few times when a extra set of hands would have came in handy. This will make those times seem like a distant past. 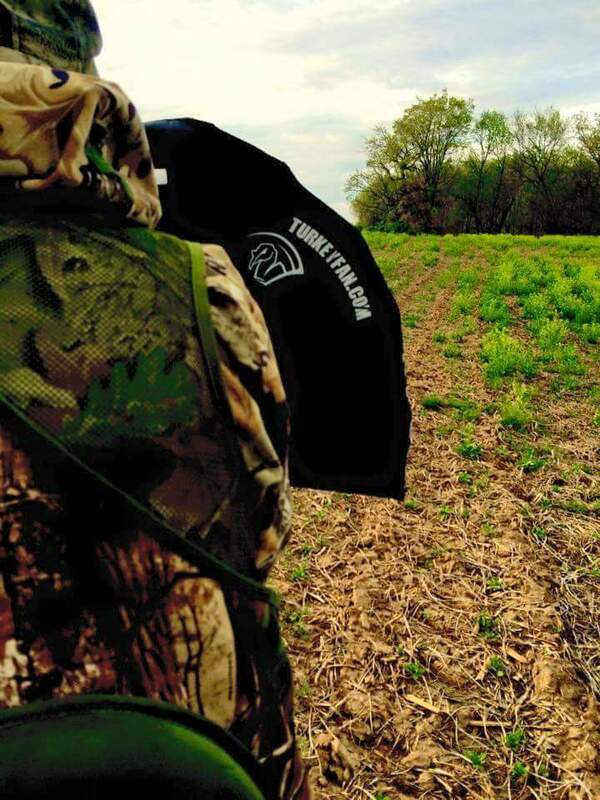 Recommended use for the turkey fan is in a private land hunting scenario where you know there are no other hunters in the area. 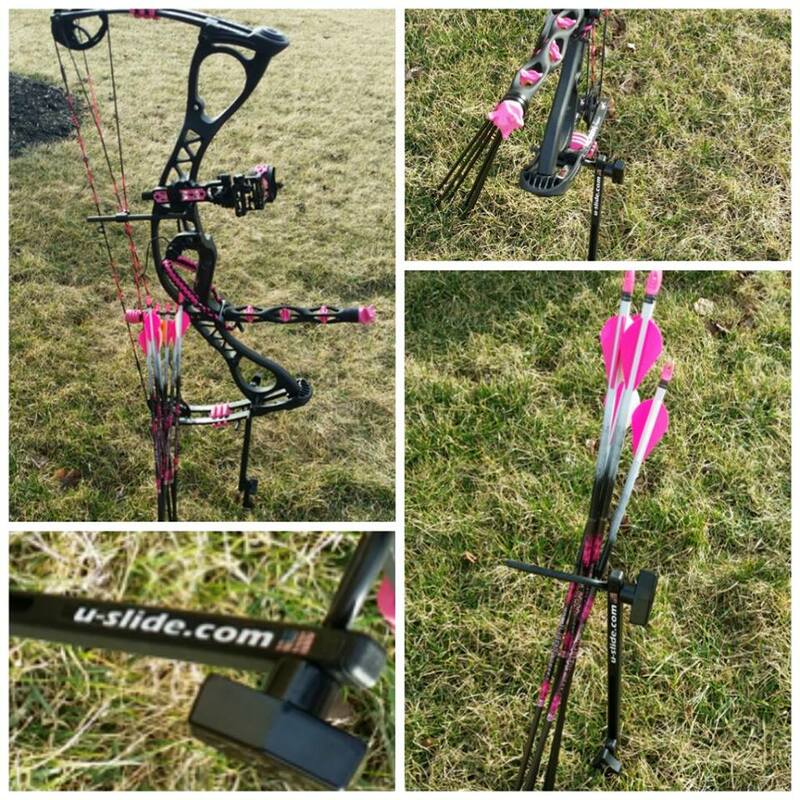 Perfect for a close encounter spot and stalk that is sure to get your adrenaline pumping. 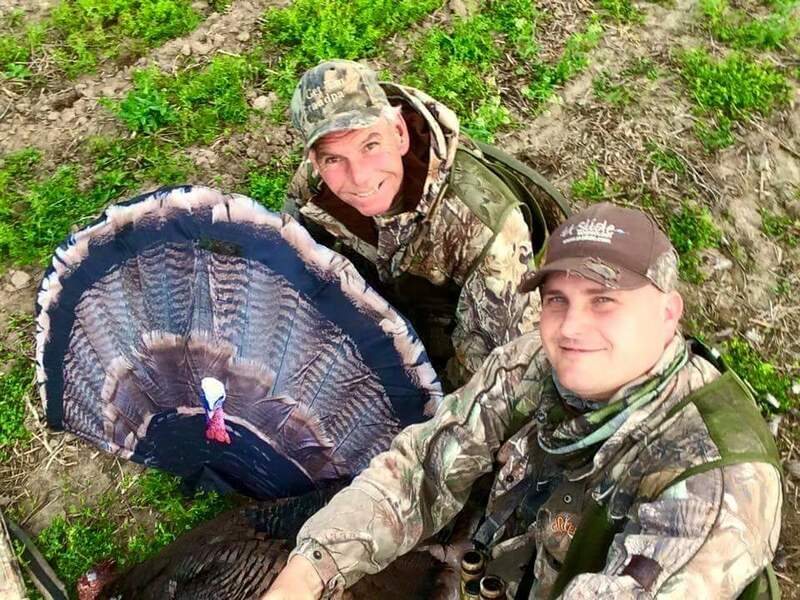 This is a great way to see just how close you can get to a wild turkey and a experience of a lifetime. 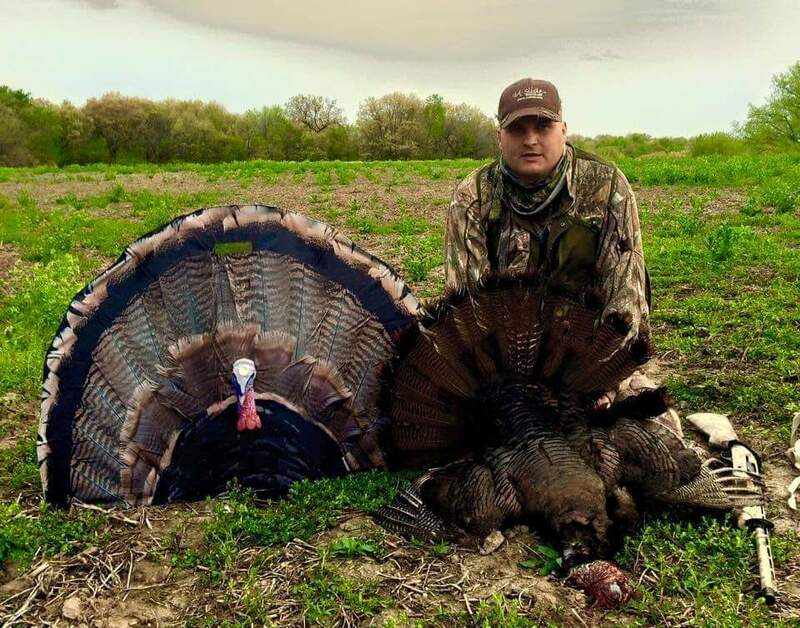 The Turkey Fan has proved itself over and over this season as I was able to successfully spot and stalk a Eastern in Ohio, getting within 30 yards of the bird before my hunting partner was able to get a safe and clear shot. The fan is so lifelike that we closed in on a group of unsuspecting Tom’s before we proved the deadly force of my newest favorite toy. Check them out yourself at http://www.turkeyfan.com and on Facebook at http://www.facebook.com/turkeyfan. You will be glad you did! Once you have cut the fan from your turkey to preserve it you have several days before the drying process begins while in the folded position. I would recommend setting the fan as quickly as you can in most cases though. With these two Rio fans I waited approximately 4 days before I was able to set mine after my travels. To preserve the fan you will need a flat surface for the drying process. Cardboard is ideal for this as you need to use push pins to hold the fan in place. Cardboard will be the easiest method for applying the push pins with little to no effort other than placing them in position. Find a box or piece of cardboard that is big enough to hold your fan. Salt (idodized table salt is okay to use as pictured above) to cover the areas of exposed fat tissue. A cardboard platform to hold your fan. Push pins to hold your feathers in place during the week long drying process. Place cardboard in a safe area for drying. You will need to leave your fan for at least 1 week. Have your push pins and salt handy. Trim away as much fat from where the fan was cut away as possible before pinning the fan down to the drying board. 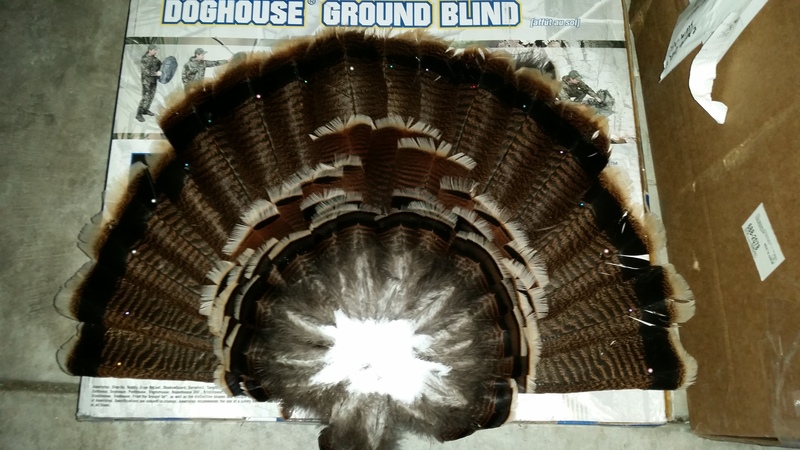 Start by placing the fan on the board so that all of the feathers are on the board as pictured above. From either left to right, or right to left depending on how you work start with the first feather making a straight line across the bottom of the board. Place your first pin into the feather closest to the quill as possible as to hold the feather in place. Take the next feather slightly overlapping the first feather and place a pin just as you did with the first one. 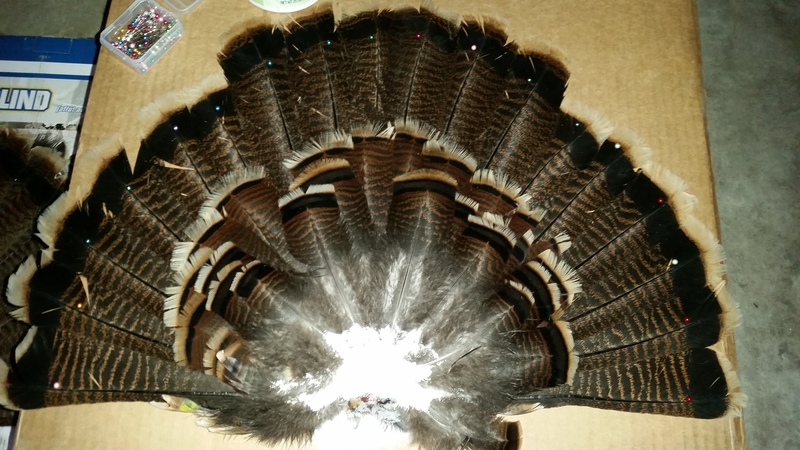 You will repeat this process with each feather until all feathers are pinned down and your fan should be full with no gaps between the feathers. Once the fan is in place and you are happy with the way it looks cover the area where you cut the fan away with salt. Don’t use the salt sparingly. Make sure to cover the entire area for the curing process to begin. Leave fan in place in a cool, dry area for one week to dry. Once dry you can remove each of the pins from the fan and carefully lift and dump the excess salt. You a small paint brush to remove excess salt as needed. Your turkey fan is now preserved and you can find your favorite mounting piece to display your trophy. To preserve your turkey beards simply place them in a zip loc baggie with salt and leave while your fan is drying. Start with a good Marinade. If you’re not confident in your own cooking skills go with your favorite 30 minute steak marinade. Slice Chops into nice sized cubes. Place in a container with Marinade and refrigerate for 30 mins. 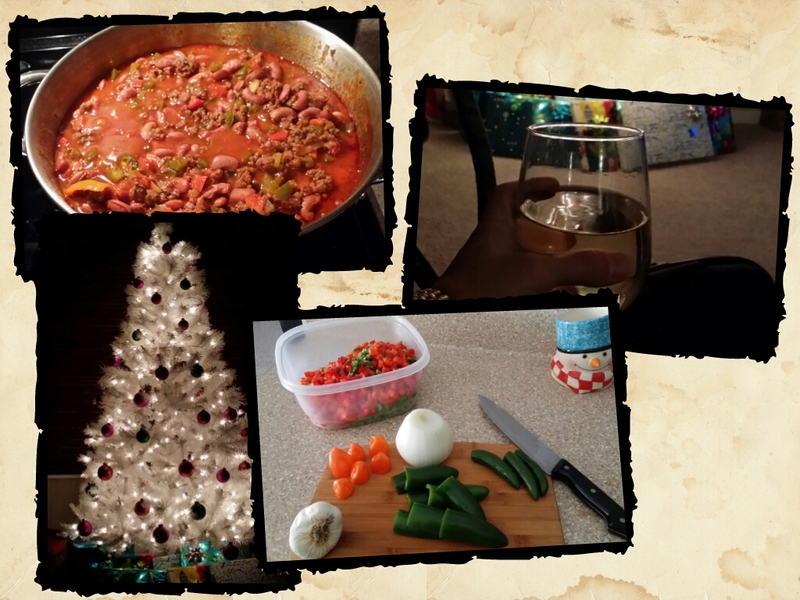 While the venison is marinating prepare your veggies. 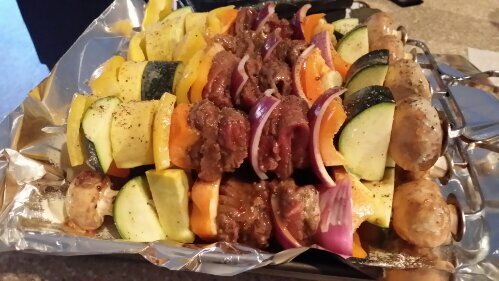 For the pictured Kabobs I used several different veggies. Yellow & Green Zucchini Squash. Red Onion. 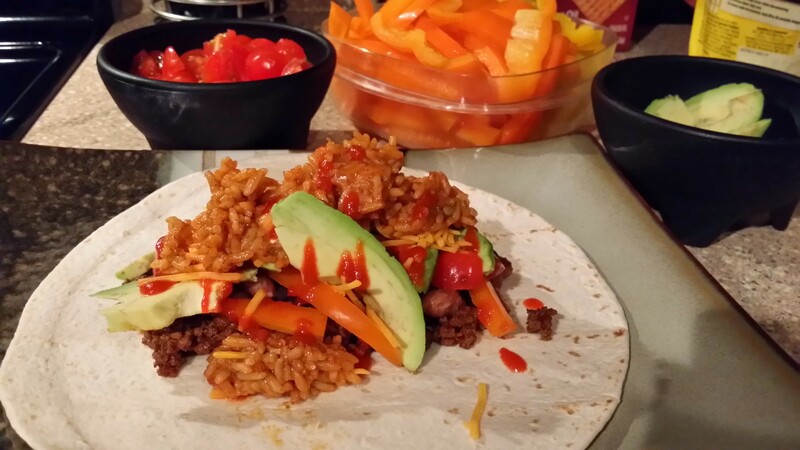 Yellow & Orange Bell Peppers and Baby Portabella Mushrooms. Skewer veggies first so that your protein is grilled between the veggies to help infuse the flavor. Add Venison and fold meat in half if cooking to rare meat temperatures to avoid overcooking. Spray veggies with fat free butter spray or olive oil. Place on grill over med-high heat for at least 8 minutes and turn once. Grill for an additional 8 minutes for medium to med-rare.